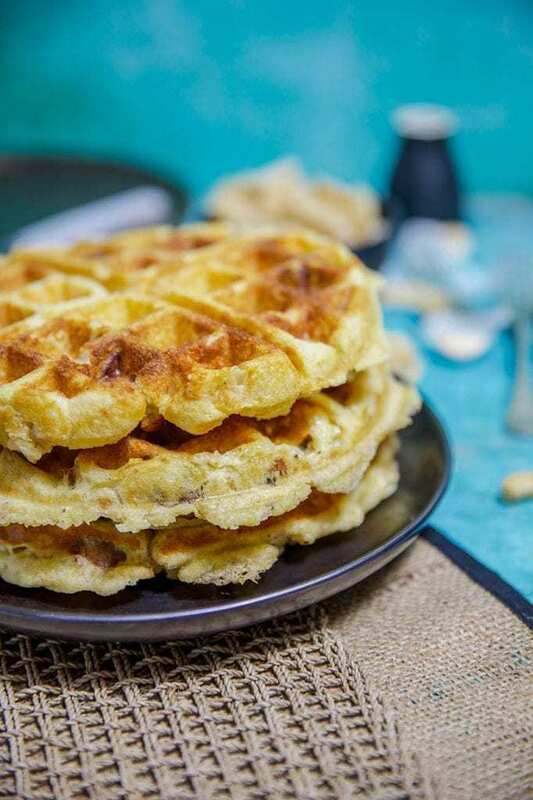 If you haven’t tried keto waffles then it is time to start! They truly are delicious! I bought a waffle maker long before ever going keto. I did use it a few times but not a lot. 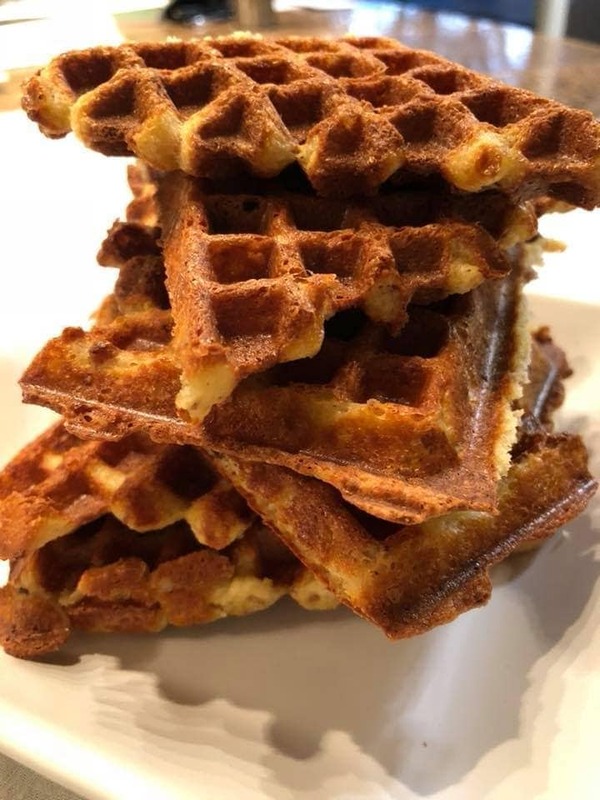 Since going keto I have to say keto waffles are so good, so tasty, so easy and a personal favourite. 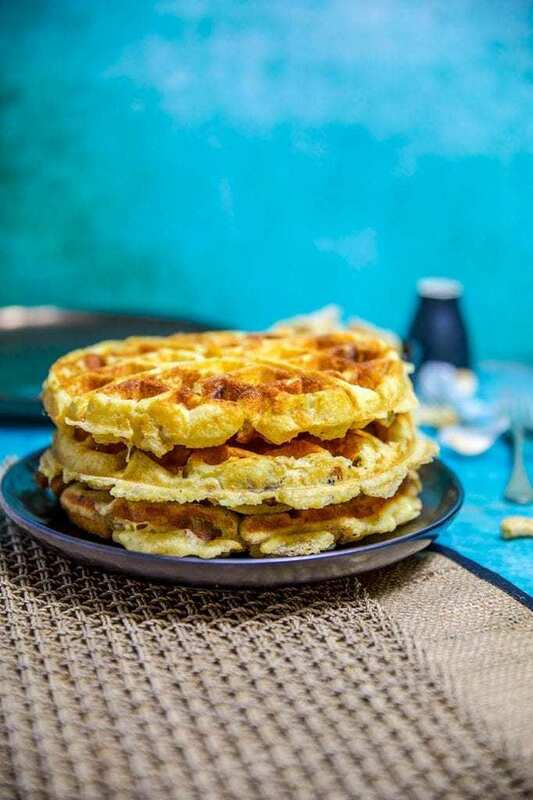 You can find keto waffle recipes throughout my books, this website and the members recipes. 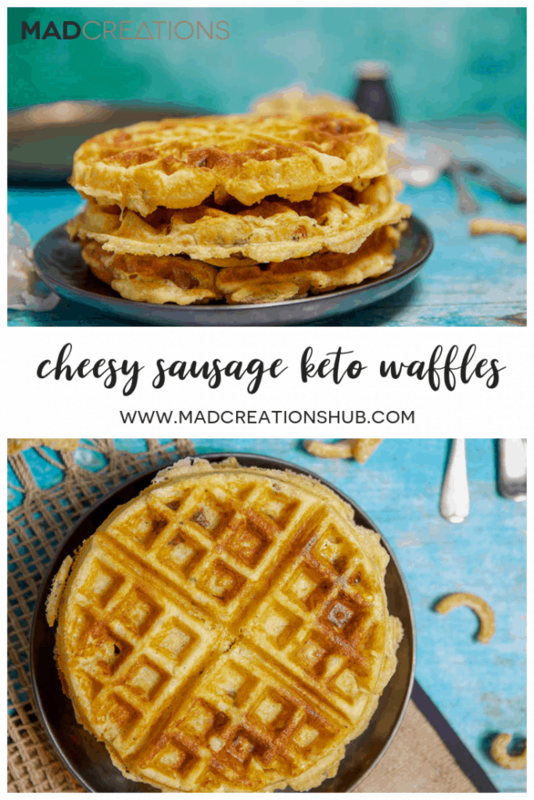 From sweet to savoury keto waffles or bloody awesome! This version is sooo good. It is like a Maccas style sausage mcmuffin in a keto waffle. 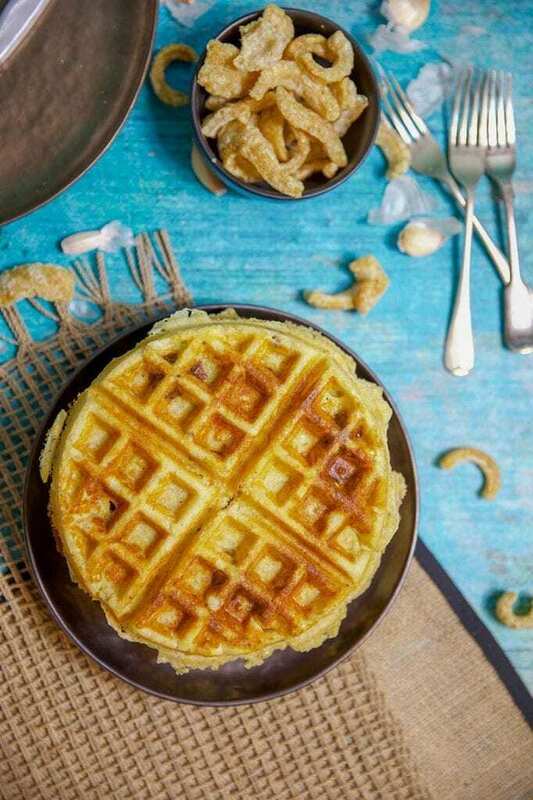 You can easily see by the images that these keto waffles puff up and are super light and crispy. They are so good slathered in butter or some my favourite, sliced avocado with salt and pepper. A match made in heaven. The batter is stiff so don’t thin it out when making them. Before you ask about the whey protein, I will let you know I use it to deliver a perfect light crispy texture. 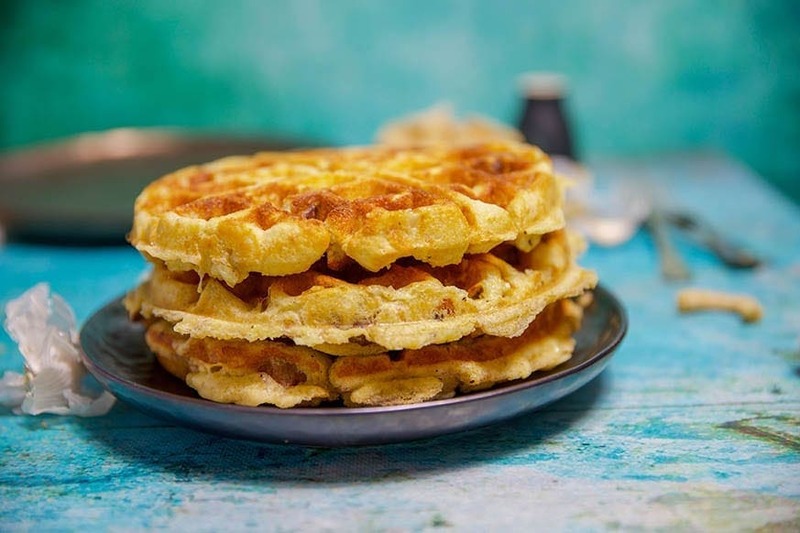 You can substitute with pea protein or leave it out if you want but it is very much a key ingredient to making a light crispy waffle. If you do leave it out add a little more almond meal to replace it. I have made these with both the almond flour or substituted with crumbed pork rinds for a nut free version and both work perfectly! Add any spices, herbs, chillies or any meats and veg you like to make your own signature variations. Clicke here or the image below to check out all our cookbooks in store today! 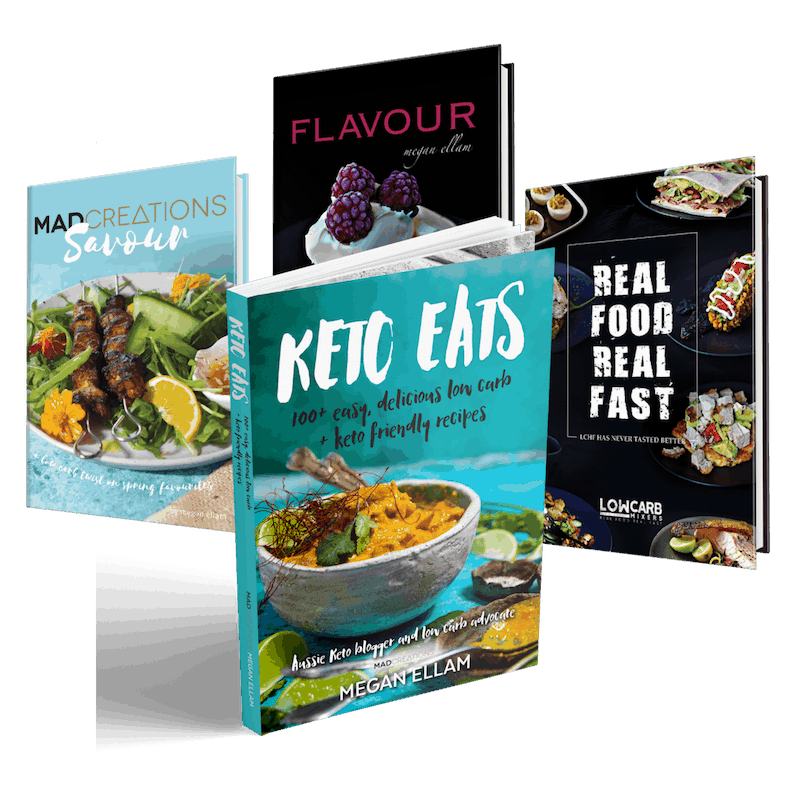 Keto Eats, my newest cookbook packed with 100+ delicious and easy keto recipes. Delicious crispy cheesy deliciousness for breakfast, lunch or dinner! Squeeze out small meatballs of sausage from the sausage skin. Fry off in a frypan over medium high heat until cooked through. Reserve. Melt butter on stove or microwave for 1 minute. Add remaining ingredients to a mixer with dough hook or food processor and mix until completely combined. Fold through sausage meatballs. Cook in a preheated and buttered waffle iron according to manufacturer’s instructions. Serve with extra butter and avocado. Melt butter 3 minutes/80℃/speed 1. Add remaining ingredients and mix 3 minutes/dough setting. Fold through sausage meatballs. Serving size is one wedge of the waffle. You can increase the serving size while still remaining very low carb. The serves are surprisingly very filling. For a vegetarian alternative swap the sausages out for mushrooms. jalapenos, artichokes, or tomato and green onions. Waffles are suitable to freeze. For a nut free alternative use sunflower seed meal. 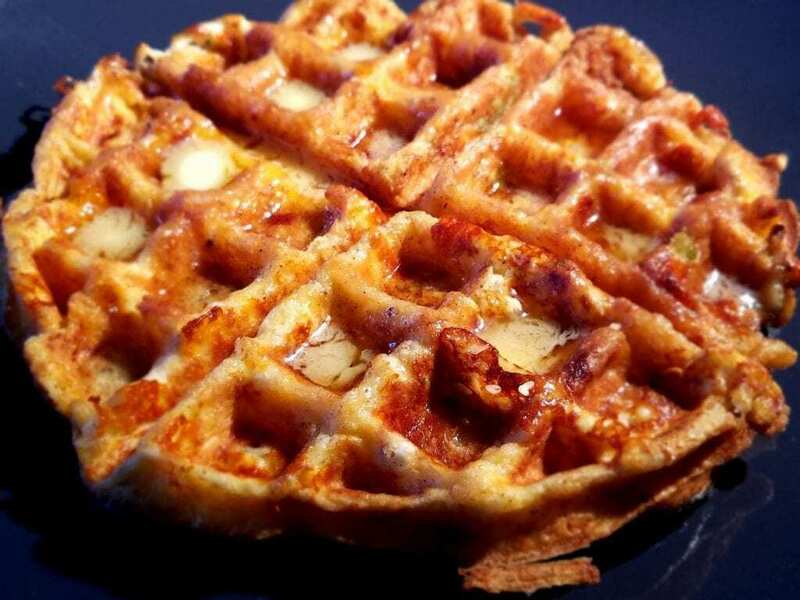 You had me at cheesy waffle!! what does the * mean at the wpi ? Can I omit it? Hi Victoria, the two sites are currently one. I would recommend installing ad blockers so you dont have to read them.